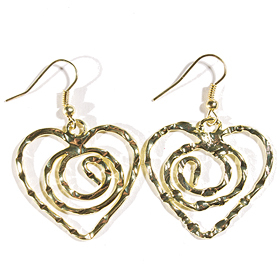 An unusual set of hammered heart-shaped "spira" earrings with French hooks for a comfortable fit. Some believe that the swirl motif is the symbol of eternity, others the maze in which the Minotaur used to live, or an artistic interpretation universe's infinity. We are not sure which one is right, but we are sure that these earrings will be receiving infinite admiration with the simple yet sophisticated style. Make a great romantic or Valentine's day gift.